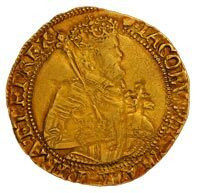 Obverse: Crowned and armoured half-length figure of James I. Facing right, holding orb and list-topped sceptre. With Legend: (tun) IACOBVS : D : G . MA . BRI . FRA . ET . HI . REX . Reverse: Crowned shield with coat of arms in foliage, flanked by I-R initials. Legend: (tun) . FACIAM . EOS . IN . GENTEM . VNAM . James I, was King of Scots as James VI from 1567 to 1625 and King of England and Ireland as James I from 1603 to 1625. He became King of Scots as James VI on 24 July 1567, when he was just thirteen months old, succeeding his mother Mary, Queen of Scots. 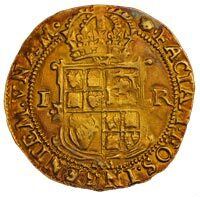 Regents governed during his minority, which ended officially in 1578, though he did not gain full control of his government until 1581. On 24 March 1603, as James I, he succeeded the last Tudor monarch of England and Ireland, Elizabeth I, who died without issue. He then ruled the Kingdom of England, Scotland, and Ireland for 22 years, often using the title King of Great Britain, until his death at the age of 58.